The Imperial Hotel is an eight-story early 20th-century hotel designed in a variation of the Chicago style. It is one of the remaining tall buildings in Atlanta built in the Chicago style during the city's first era of skyscraper construction. This style features a tall, narrow profile, a tripartite exterior design, an internal skeletal frame supporting exterior veneer walls and elevators. This hotel is especially noted for its extensive bay windows, a relatively rare sight in Atlanta. It is one of the few surviving modestly-priced hotels of this era that catered to the businessmen and tourists who flocked to the rapidly growing city and formed the mainstay of its hotel business. 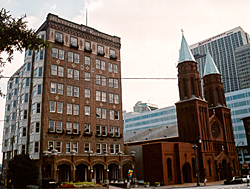 In addition, the Imperial Hotel played an important role in the commercial development northward along Peachtree Street. The rectangular, flat-roofed hotel has a reinforced concrete frame faced with red brick veneer inset with terra cotta. Its front facade has a tall, narrow silhouette, subdivided into a tripartite arrangement of a projecting first floor, a plainly detailed shaft and a more ornate cap. Between the pairs of double hung sash windows, vertical pier-like sections rise uninterrupted from the second to the seventh floor where a string course marks the start of the cap. Both sides of the building are articulated with seven rows of bay windows which extend as continuous projections from the second to the eighth floors, alternating with rows of small sash windows. The projecting first floor, providing a nondescript entrance to the hotel, was built in 1953 to replace the original open brick arcade with Tudor arches. On the interior, the hotel has public areas on both the first floor and in the basement with hotel rooms above. The first floor contained a lobby and a lounge area which was extensively remodeled following a 1968 fire. Some historic features in the lobby included a Tudor-arched stone fireplace, marble wainscoting, crown molding around the exposed concrete ceiling beams and a fan-light above the opening to the lounge area. Two historic Otis elevators with all their original equipment and a stairwell rise through the building. The upper floor rooms are organized off both sides of a T-shaped central corridor. The hotel was vacated in the early 1980s, and stood empty until a rehabilitation effort in 1996 restored the building into a low-income housing project. 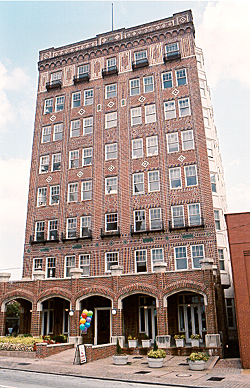 The Imperial Hotel, 355 Peachtree St., now contains 120 apartments. It is not open to the public.